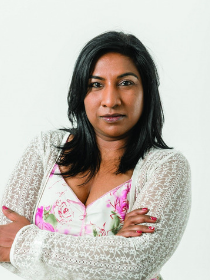 Ranjeni Munusamy is Associate Editor: Analysis for Tiso Blackstar, formerly known as the Times Media Group. She previously worked as Associate Editor of Daily Maverick and is a prominent commentator on South African politics. She has over 20 years’ experience in journalism and communications. She has worked as a political correspondent at several South African media houses, including the Sunday Times. Ranjeni also served as Head of Communications in the Ministry of Higher Education and Training in South Africa.